After describing his working methods, Robert writes of the inspiration behind the 90 prints illustrated. This often evokes memories which allow him to wander into autobiographical anecdotes, thoughts about the artistic process, and any other ideas that a particular print provokes. In the final section of the book he demonstrates the use of linocuts for posters and dust jackets, especially those he designed for the prestigious New Naturalist series. And the best natural history book of the year has to be Cutting Away. Gillmor has been at the forefront of bird illustration since before I can remember, yet still retains an extraordinary enthusiasm for his subjects and his work. A truly beautiful book. 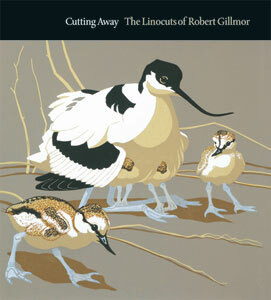 This beautiful book presents a striking series of linocuts….No one over the past 50 years has left a greater mark on the art associated with British Ornithology than Robert Gillmor, often in books by others. This volume consists entirely of his own work and the bold, colourful prints selected are quite splendid. This is a beautifully produced book of lovingly crafted plates. Craft into art! Cutting Away works on two levels….literally the title refers to the way the artist works a sheet of linoleum, scoring and gouging the surface into a negative of the subsequent print.